Similar inscriptions were found, such as “kk. kiiii. kkk” on the Ellestad stone, “ltlsssiiikutramsstltttll” (Nore stave church, Norway), “laþu aaduaaaliia alu” (Funen bracteate), or “þmkiiissstttiiilll” which can be read on both the Ledberg and the Gorlev stone. It is funny to read what interpretations can be given to these lines of runes. Arild-Hauge, for example, gives an inscription that goes “r.a.þ.k.m.u:iiiiii:ssssss:tttttt:iiiiii:llllll” (“This inscription is attached to the Galder song Buslubæn, i.e. Bula’s curse, which is written in Bóse’s saga.”) and says: “The inscription is interpreted “ristil aistil þistil kistil mistil listil” by means of each of the 6 first runes – r.a.þ.k.m.u. – is attached one rune in each of the 5 groups with i s t i l”. a magical formula with Kaunan and Isaz as the basis. Often, these secret runes can be interpreted as follows. The group of identical runes represents the rune carved, and the number of times that the rune is repeated represents the position of the second rune in the same aett. For example, kk represents rune k, Kaunan, since it is found in the first aett, and it is repeated twice, it is also referring to the second rune of the first aett which is Uruz. So kk represents Kaunan followed by Uruz; kkk represents Kaunan followed by Thurisaz, while iiii, with Isaz being the second aett, represents Isaz followed by Ihwaz. The magical formula would be thus: ku kiï kþ. An interpretation that I never heard. On other places on the same site, the strings of characters are described as: “Side B obviously contains a magical formula” (Lindholm amulet) or “As we have seen in # 22, one can decipher the magical inscription as auduaþlina.” (Funen bracteate). The first part can be translated as ‘I, the erilaz here, I am called the Sly’, but of the second part nothing can be made except for the word ‘alu’ […]. The part ‘aaaaaaaazzznn(n? )bmuttt’ is untranslatable. It isn’t just a word, but a magical formula, a spell. The name of the A-rune is ‘Ansuz’, which means ‘god’. The word ‘god’ is repeated eight times here, eight gods are being called upon. Three times the Z-rune (Algiz) could refer to (a plead for) protection, while the N-rune (Nauthiz) points to danger […]. The three T-runes (Tiwaz) represent victory. This quote comes from the Hermetic Nag Hammadi text “The Discource on the Eighth and the Ninth” (“celestial sphere” I might add, also called “The discource on the octoade and the eneade”). This comes from the Papyri Graecae Magicae (PGM) and I can tell you, it can get more crazy than this. Read my article about these texts if you are interested. There are a few things that are the same in both contexts. ‘Normal writing’ suddenly goes over in magical formulas. In the runic inscriptions it bluntly says something like “this inscription was made by me” and then strings of runes follow. The same goes for the Hermetic initiation into the eighth and ninth sphere. Another similarity is that scholars don’t have a clue what to think of these strange writings. The quote from the Nag Hammadi library has the formula in the way I gave them (under eachother), but most translations just put them after eachother (I think the writer must have had a reason to order the characters like that). I have two translations of the PGM, one of them often leaves out the formulas or simply says “Vokalen” (“vocals” in German). The runic scholars seem to be a bit more fair and at least give the characters in their translations. What is also the same in both cases, is that no conclusive theory of the phenomenon has been given. Some runic scholars seem to like to think that this is about some kind of cipher, but most writers vaguely refer to magical formulas. This seems to imply that certain characters refer to certain entities, that the numbers of characters have their meaning, etc. In the magical papyri of the first centuries of our era the secret name of god is called upon frequently with the seven Greek vocals: a e e- [with the – above the e] i o u o- […]. Thereby the vocals could be ordered in several ways. A well-known method is to increase them in number (aeee-e-e-iiiiooooouuuuuuo-o-o-o-o-o-o-), which allows them to be formed in a ladder (Greek: klima) or a double ladder, which makes a piramide. 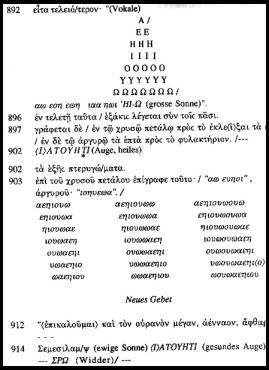 […] For the Greeks the characters also served as numbers (a=1, b=2, etc.) and musical notes. In astrology the seven vowels are connected to the seven planets who produce the music of the spheres in their circular paths. For a good effect the vowels had to recited in certain positions, for which the magical papyri give some clues, for example for the a: facing east, with both hands to the left, with the e: facing north, with the right fist forward, etc. The way the different vowels were pronounced was also of importance for the effectivity of the spell, and also herefor prescriptions are given: de a rolling like a wave, the e in the manner of a baboon, etc. I am not claiming that the traditions of the PGM and runic magic are the same, nor even that they have the same source. It might be interesting to find out if this could be a theory that can be posed though, but for now I only want to point towards the similarities. Also I do not give explanations for the inscriptions, I know. I like to think of them as magical sounds (just think of the famous “AUM”) that were used in incantations or maybe even prayers. Undoubtely this is a tradition that we have lost and we no longer know the meaning of them, but it is nice to see that similar formulas were used in the Hellenistic Egyptian (Nag Hammadi, Hermetica, PGM) context around the beginning of our era and also in Northern Europe many centuries later. Who knows what more traditions have the same thing and one tradition may shed light on another. Scholars spare no effort ignoring rune magic. The Anglo-Saxon Franks Casket (7th century) proves the magic use of pictures, runes, numbers, and values on its four panels and lid. Example: The front shows Welund, the famous wealth creating goldsmith, and the three gift-bringing Mægi. The text running around these carvings alliterates on f (feoh = wealth) and g (gifu = gift). This does not only suit the pictures but also the likely contents of the chest: feohgift i.e. golden trinkets with which the King used to award his warriors in the mead hall. Not enough: There are certain powerful numbers like 3, 9, 27 (3×9) or 2, 8, 24 and 72 (3×27). The text on this panel counts 72 characters. Calculating their value according to their position in the fuþorc we arrive at 720. – By the way, Lindholm’s auduaþlina values 72. The other panels show similar results. R for the way to war, T for victory and justice, H for mishap, S for life and Æ for luck in battle. Each of the 3 life procuring panels starts with a charm of 9 runes (27 altogether with a value of 330), the remaining fourth panel, procuring heroic death, bears a charm of 9 runes, value 110. The whole set of panels is meant to protect the owner from birth to death and beyond, his afterlife in Valhalla. A major part plays the Fylgja or Valkyrie, whose symbol is z the Z-rune. She protects her protégé in life and procures proper death. (There is more on Naudiz and Tiwaz).